Right before our eyes, one of the bastions, a hypothetical pillar of the whole personal audio has collapsed – keeping low profile, yet still-alive: Sony has come up with a video-enabled player. The globe-wide famous corporation, the pioneer of personal audio, that lost its share when the market of MP3-players was only emerging, has had only quite conventional solutions in its range so far. 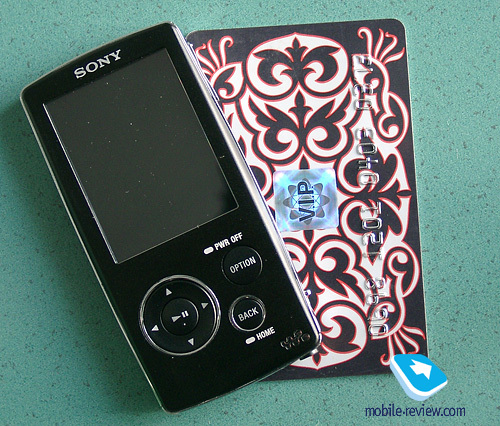 Many analysts and MP3-enthusiasts as well, have often ended up perplexed – how Sony, once the industry’s undisputable leader, could feel content with this state of affair. Apparently, over at the company that had good understanding of that and were getting ready for a rapid leap-up to jump over the stages their rivals had spent years climbing to, and forge into the lead in an eyeblink. 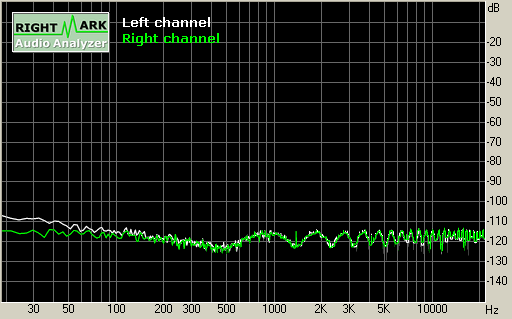 And it seems the A800-series players should be this leap-up. They retain loads of refinements touching every last thing that Sony has got in its personal audio bank. And more importantly, the player wholly meets today’s cutting edge cliche, at least with its spec sheet. The A800 line comprises three models, and Sony holds its own here again, having different names, specifically, digital indexes: the A805, the A806 and the A808. Functionality-wise these don’t differ a bit, the only aspect setting them apart is volume of inbuilt memory – 2, 4 and 8 Gb respectively. Take note, we are speaking of a Sony-branded product, whose new flash-players were miles behind the competition in terms of bundled storage size, yet somewhat held much heftier price tags. Obviously, they have made proper conclusions and the ads for the new models now feature “adequate” numbers, and the brand followers, as well as neophyte, could be happier. However, these players have some more bells and whistles apart from the memory volume. 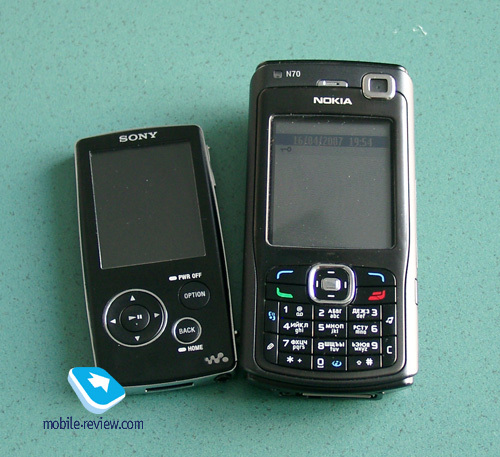 For starters, it is the decent 2-inch display, which is the first thing you come across. Sony have done itself justice and crammed into the player a really brilliant screen, which seems especially outstanding against the lowly specs of other company’s offerings. 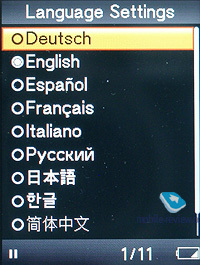 More on the display, its specifications and our impressions – below. Naturally, such display is here not to allow for reading track titles alone. 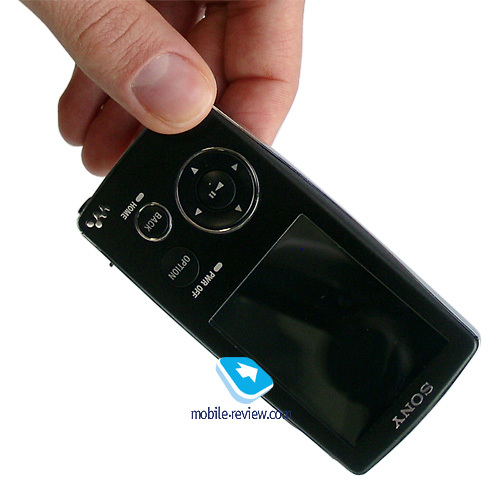 To keep it busy, the players belonging to the series have acquired the capabilities characteristic to the today’s MP4-devices, namely photo viewing and video playback. Though, in a way, these players do resemble Apple’s products, omitting FM-tuner and a built-in microphone. 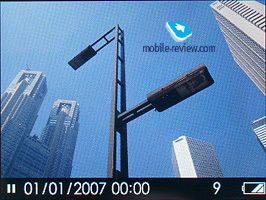 But there are some good things about it – for example, it shares some more traits with the iPod Nano – following the latest trend, the developers have armed portrait-oriented players with slim profile, which really gets its visual appeal to a higher level, since other traits, like the controls layout and looks are nothing new, being familiar to some from the previous Sony’s devices. So, that’s about time when we are wrapping the introduction up and getting down to business. The players coming from this series have got equipped with quite modern casing, that, nevertheless, its design cues are in line with those recently released models and have the company’s trademark touches. The main color solution employs the safest combination of black and silver, similarly to the S700 series. At that, much like in that range, the 800’s metal casing is framed with chrome-coated edging. And this lends it “mature”, solid feel, Sony has set off to appeal to the broader audience and get back its long-gone fame and authority – make no doubt about that. Though, they haven’t leaved out the trendy looks either – players clad in pink, white, violet and black are available as well. The build quality is exactly what we have come to expect from the company – decent, and it does offer you such a robust feel. The player boasts well-tuned solid casing, despite being wafer-thin. The U-shaped edging makes it even stiffer – as a result the casing doesn’t bend, even if you put some effort in it. The display takes up the most part of the front fascia’s real estate, with the controls placed beneath. The upper end and the left-hand side are left bald, which is not very like Sony that used to tack buttons on all surfaces at hand. Though there are still some signs of this left – the Hold switch is mounted on the rear, whereas other vendors prefer flat back plates. Perhaps, these quirks have something to do with challenging process of making a metal frame with numerous holes or fragility of such design. The right spine holds the volume rocker (top) and the rest key (bottom). Finally, the lower edge plays host to the WM-port and the audio jack placed right next to it. It’s quite odd, though, that many “nano-esque” top-of-the-line players headphones connector is always located at the bottom. Could it be due to circuit design? Or some eggheaded marketer decided that this would be much handier (marketers, don’t get mad at me – I meant only one)? Some more words on the design. Maybe, these are my old sympathies for the brand rising from beneath, but the route Sony has picked seems right, the company doesn’t step aside from its old traditions, yet its products don’t appear to be an anachronism. All this indicates serious treatment of design. In their times, Sony-branded digital players were going from extreme to another, however today they feature one style, which is really inspiring. At that all Sony’s players are “for adult”, aimed at broad, yet sophisticated and insightful audience, at those who know what they pay for and mature enough to appreciate classic design. 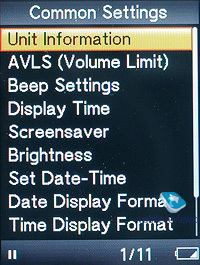 The controls layout of the A800 series has been adopted from the HDD-models of the company, the A1000 and the A3000. Basically, the “A” letter is here to show the succession line and put the fame these models gained in their times (quite minor, though) to better use. 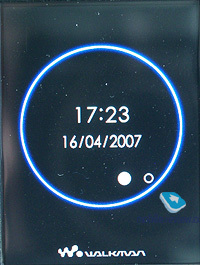 The main control element – circle-shaped four-way button with the play/pause key inside, placed right beneath the display on the left flank, the best spot to hit with your right hand’s thumb. Further right are two round buttons for calling up the context menu and going one level up. On long press the one on top doubles as the power-off button (you can call the device to life with any key), and the lower key brings up the main menu, skipping all levels and sub-levels. 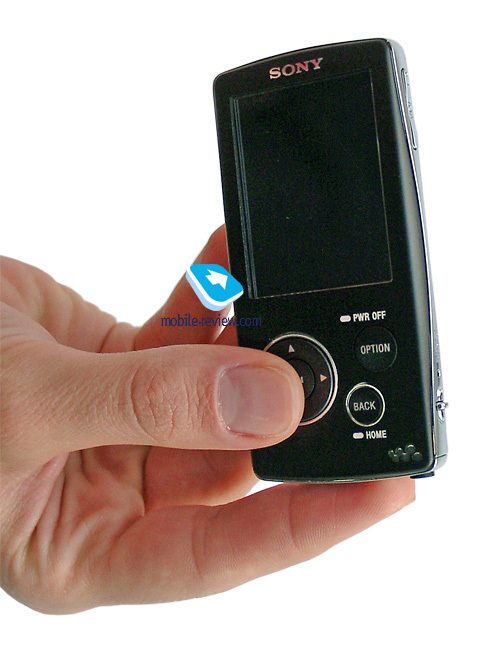 The buttons are average in size and are easy to press, delivering the following tactile feel: medium travel and decent feedback, every press is fixed with a barely audible click. All controls are designed for use with the thumb – all interactions, including volume adjustment, become a cinch only with its help. Sony has had enough time to perfect the controls layout on other models and it’s good to see that this time hasn’t been wasted. The layout deserves mostly a compliment, the player turns out to be a breeze to navigate through and straightforward when it comes to playback management; having spent a pair of minutes with the A800 in hands you no longer ponder over where your finger belongs at the given moment. As I’ve already said, to me, Sony pins its hopes on the 800-series – they players are setting off to fight back the lost positions and enable more opportunities. And the centerpiece, that picks all eyes around, if you want, the thing that sells the player, is its display. Offerings sporting decent displays onboard generate more hype, they are easier to use, a pleasure to talk about. 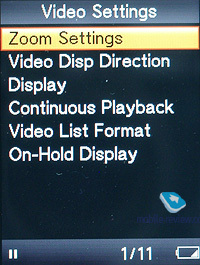 And the last but not the least, any adequate display provides for great video and photo viewing experience – take note, these features have made their first appearance in Sony’s players today. That is why the A800 series come equipped with one of the most brilliant screens to date, that doesn’t end up too far behind displays installed on handsets. 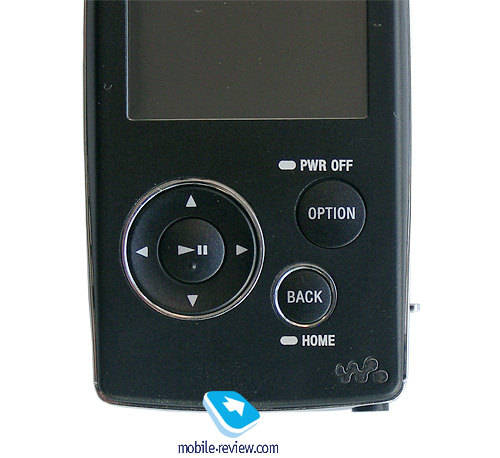 It employs TFT-matrix, measures 2 inches from corner to corner and boasts QVGA resolution (320x240 pixels) – such display have only begun making their way to the personal audio market. One of the most recent lucky owners – the Cowon D2. The picture presented by the A800’s display is vibrant, sharp, which is what everyone stares at when looking at a working player. The colors are very saturated and rich – pictures we have won’t give you a complete idea of that. This display is indeed one of the market’s best today and definitely something we praise. In fact, salesmen would be better off putting them on the shelves turned on – design is one thing, but the eye-candy picture is beyond competition when it comes to drawing eyes. Regrettably Sony doesn’t quote how many colors and hues this screen is capable of, but by the looks of it, its at least 262 K.
The menu layout, much like the controls, has been ripped from the A-series HDD-players. 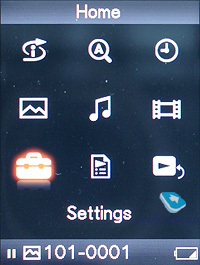 The main menu is called Home (apparently, not to let you confuse it with something else) and consists of nine icons arranged in a grid. The thumbnails are quite poor, when speaking of the details, but such minimalist design fits the player’s style very well. 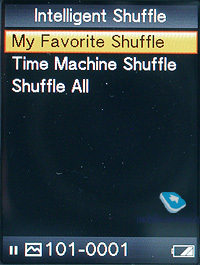 Menu: Intelligent Shuffle, Initial Search, Clock Display, Photo Library, Music Library, Video Library, Settings, Playlists and Now Playing. Intelligent Shuffle. 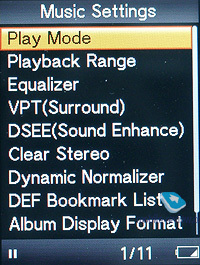 Manageable random playback mode. Initial Search. Navigation through tracks, parameters: track title, artist, album. Photo Library, Music Library, Video Library. 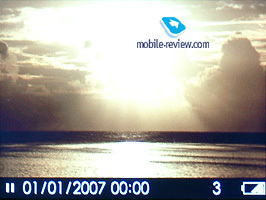 Viewing files stored in the memory: images, audio-files, video clips. 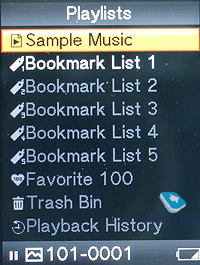 The Music Library has just the same criteria as the Initial Search. Settings. 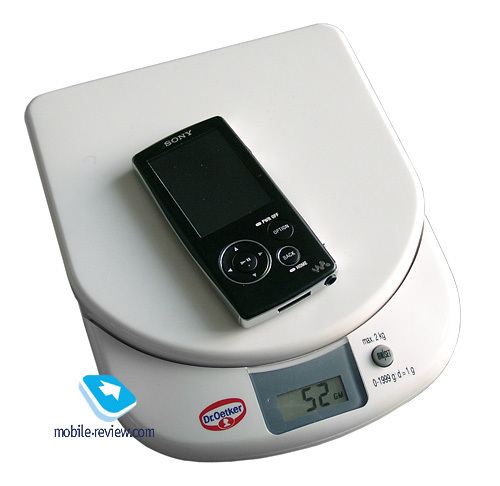 This item comprises stand-alone options for music, photo and video, general settings for the rest and menu language selection. Playlists. Tools for handling playlists. Now Playing. Switching into Now Playing screen. Also, there is a context menu available, that can be called up using the Option button regardless of which player mode you are currently in. Depending on that, the contents of this menu may vary. 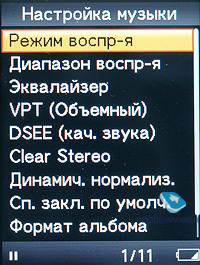 For example, when listening to music, with this menu you can modify playback mode, equalizer, sound settings system, album art. Also you can learn more about the file, place a bookmark, add it to the “recycle bin” and enable on-screen clock. The “recycle bin” for files works pretty much in the same way as its desktop counterpart. Files placed in there may be deleted or restored. The menu structure is quite straightforward and clear, which makes for some good experience. Personally, I found only one niggle with it – the context menu not all options from the Settings menu for a respective mode, and thus forces you to search around the player for a concrete option. Maybe, this is crucial only for me, who is spoilt with players, where all settings are stored in one menu item, while the context menu is omitted, even though it’s a handy tool. The player’s power source is a Li-Ion battery, whose specs are, as ever, concealed by Sony – we couldn’t find any data with search either. Probably, they are doing that on purpose, so as to not give the opposing companies even a slightest hint of the secret why their players are so long-lasting, or, which is more likely, this is a mere fantasy. 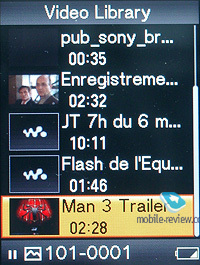 The battery life you get on a single charge is traditionally high for Sony – it quotes 30 hours (playback of ATRAC files) for music and an impressive 8 hours for video. Naturally, the A800 packs the trademark Stamina technology that has already been proven on loads of other company’s portable gadgets When tested, partly charged player gave us more than 20 hours of lifetime and charged up in a tad more than an hour. The battery charge is replenished via USB, which doubles as the way to connect the player to your PC. Sony is really into implementing own standards and couldn’t miss the chance to equip this player with the proprietary WM-port, for which it is going to release more accessories (there are already a number of mini-systems with support for this socket). The full charge time makes up a bit more than an hour, which is an adequate result in view of the battery life you get and the power source (USB). Your operating system picks up the A800 as a removable drive and thus enables using it for storage purposes with the entire memory volume at your disposal. Quite expectedly, you can’t get music onto the device this way, well, you actually can copy it, but the player will not recognize it. The data transfer speed tops out at 1,5 Mb/s, which is average – it could use some speed-up. 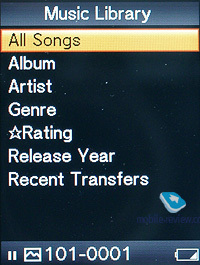 For uploading music and album arts there is Sony’s own application known as Sonic Stage, this time around, version 4.3, though the player is hooked up by the older editions with ease as well. We haven’t found any newsworthy differences from the previous versions, but the stability and overall speed of the application have definitely gone up. The speed you reach when moving music onto the player via Sonic Stage is generally the same as that when copying it directly into the device’s memory; the program no longer re-encodes files into ATRAC format, which is obviously a leap up for Sony, albeit expected. 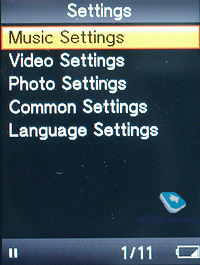 Video clips are treated in a remarkable way – you have to move them into proper folders in the player’s memory manually. Such twofold approach is quite rare, though it still exists. The ability to get video onto the player manually brings about another obstacle – you need to decode clips on your own as well. Of course, building a converter into the software manager would have been a more consistent solution, though for some reason the “grandees” don’t favor this way, maybe, looking for a boost for sales of properly coded and sized clips in their own online stores. Whatever the case is, the player handles video in a very convenient fashion: even with my skepticism about watching movies on petty displays, I would rather enjoy a light comedy with the A800 on a road. 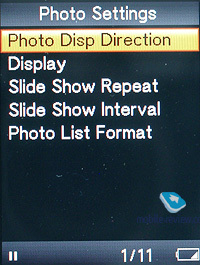 The fact of the matter is that the display’s resolution is more or less competent for the details the picture has, and the diagonal is longer than that on most MP4-players basing off flash memory, after all. The video playback is very smooth, I didn’t encounter any decoding artifacts or asynchronized image on the screen and sound. 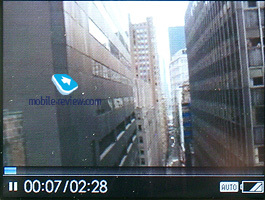 It is good to know that the A800 easily deals with MP4 video clips re-coded by me via Videora iPod Video Converter for use with the iPod Video. By the way, it is not the least valuable trump, in light of the competition with Apple’s players. 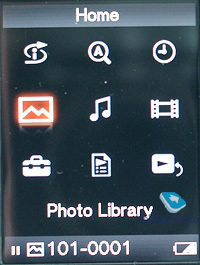 The photo viewing capabilities found in the player are quite standard, yet comprehensive: you can start a slide-show with music playing in the background, turn the photo. 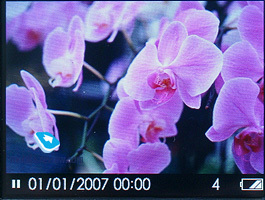 Uploading high-resolution files was never an issue, the A800 supports standard JPEG, though the company claims no support for Progressive JPEG. Like I mentioned above, photo is copied into the memory manually, and there is nothing wrong with throwing any photos into the proper folder and then viewing them. 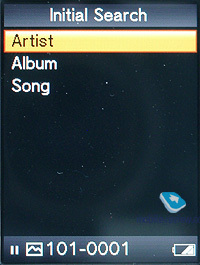 Speaking of the missteps, the player can’t come up with thumbnails for some photos, and displays Walkman logo instead. However, this has no effect on the picture quality in the end. The sonic experience delivered by the player with disabled equalizers seemed somewhat dry and flat, which is not very like the company’s products. When I’m testing new models and listening to music on the go, I usually turn all equalizers off. But I have to admit that with enabled equalizer and new Clear Stereo Clear Bass and DSEE sound processing systems the player outputs very deep and rich sound. The numbers acquired with Rightmark Audio Analyzer will give you more reliable proof, and I shall say some words about the headphones. I’m very pleased to see that Sony, whose influence on the market is still very and very big, even if not very striking, sets the trend of equipping players with high-quality earphones. The bundled units that come boxed with players by most vendors, from Archos to Samsung, almost never reveal the true potential of the player, and sometimes are much worse than average. However the headphones included with the A800-series player earn a compliment outright and deserve being used right after taking the player out of the box, than replaced, as it usually happens. The earphones have a complicated hammer-style design with sound-isolating plugs. In many ways they are similar to what the S700 comes armed with – microphones for noise-cancellation system and sound quality in particular. And I have no gripes on this front with them – the earphones sound adequately and produce decent bass and clear and sharp highs. All in all, I find the headphones very enjoyable to listen, which is a very good thing. I hope other manufacturers will pick up this trend as well. 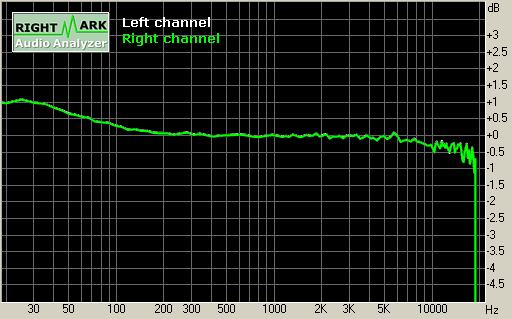 The A800-series players, to me, seem the most successful company’s product in personal audio to date. Sony has done its “homework” very well: the players have received a bevy of cutting edge features, skinny casing, handy controls, Sony’s trademark sound quality, and, surely, brilliant display. I suppose, with an adequate pricing policy and robust advertising campaign, the A800 series have all the making to set up a little earthquake for the market leaders, Apple, Samsung and Creative, and grab a solid share. The impression this player leaves is quite easy to tell about: while being able to try out and use tons of players and a few models of my own, I felt like buying the A800 for myself. And this is a quite rare occasion – previously, I had the same feeling, to get one or even not to give the sample back, only about really gratifying players by Apple and Cowon. I think, the very fact that two Sony-branded models, the S700 and the A800 have made my consumer instinct rise and shine, suggests that Sony is starting to fight its former titles back. In Russia the brand still enjoys the army of followers that has been around ever since the USSR times and in my opinion, the players will be demanded here.